The House of Representatives (Burmese: ပြည်သူ့ လွှတ်တော်, pronounced [pjìðṵ l̥ʊʔtɔ̀] Pyithu Hluttaw) is the lower house of the Pyidaungsu Hluttaw, the bicameral legislature of Myanmar (Burma). 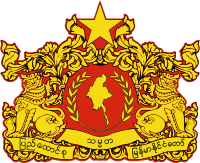 It consists of 440 members of which 330 are directly elected through first-past-the-post system in each townships (third-level administrative divisions of Myanmar and 110 appointed by the Myanmar Armed Forces. After the 2010 general election, Thura Shwe Mann was elected as the first Speaker of House of Representatives. The last elections to the Pyithu Hluttaw were held in November 2015. At its first meeting on 1 February 2016, Win Myint and T Khun Myat were elected as Speaker and Deputy Speaker of the Pyithu Hluttaw. 90% of the members are men (389 members) and 10% women (44 members) (8 November 2015). Results are as of 20 November 2015. The 3 Pa-O National Organisation candidates ran unopposed. Note: Result as of 20 Nov 2015. Elections in seven townships of Shan State were cancelled due to armed conflicts. Military appointed were not included in this table. ^ "Myanmar election commission publishes election final results". Xinhuanet. 17 November 2010. ^ "Burma's parliament opens new session". BBC News. 31 January 2011. ^ Union, Inter-Parliamentary. "IPU PARLINE database: MYANMAR (Pyithu Hluttaw), Full text". ipu.org. Retrieved 11 September 2017. ^ "The Myanmar Times Election Live, Eleven Media". Archived from the original on 20 November 2015. Retrieved 14 November 2015. ^ "Announcement 92/2015". Union Election Commission. Archived from the original on 20 November 2015. Retrieved 20 November 2015. ^ "LEGISLATIVE ELECTION OF 7 NOVEMBER 2010". Adam Carr's Election Archive. 2010. Retrieved 3 April 2012. ^ "The Myanmar Times Election Live". mmtimes.com/index.php/election-2015/. Archived from the original on 20 November 2015. Retrieved 19 November 2015.